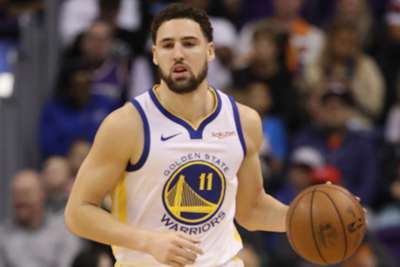 Golden State Warriors star Klay Thompson was non-committal when asked if he would make himself available for the United States for this year's FIBA Basketball World Cup. USA will go into the tournament in China as favourites as they eye an outright record sixth crown and aim to become the first nation to win three in a row. Thompson was one of five Warriors named in a 35-player roster by USA in April last year, alongside Stephen Curry, Kevin Durant, Draymond Green and DeMarcus Cousins. However, the 29-year-old Thompson said a decision over his availability would have to wait until after the NBA postseason in May and June. "You've got to ask me after the Finals," he said after the Warriors' 117-107 win over the Minnesota Timberwolves in the NBA on Tuesday. "I don't have a good answer for you. A lot can happen between now and then. "It's an honour to represent my country. It's always fun to play in China but come ask me that in a couple of months." Thompson helped USA win the World Cup in 2014 and also gold at the 2016 Olympics in Rio de Janeiro. USA will face Turkey, the Czech Republic and Japan in Group E at the World Cup, which begins on August 31.